Vietnamese-Australian superstar Van-Anh Nguyen will be a major attraction in the HBSO concert in the Saigon Opera House on September 9. 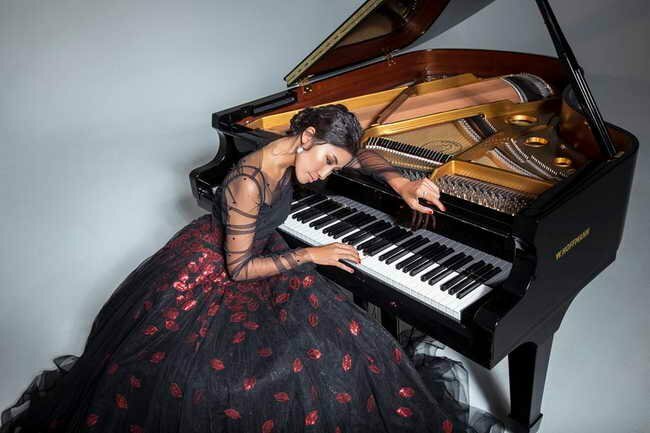 She is well known as a pianist, composer and TV host in Australia, where her engaging personality has made her a household name, and a standard-bearer for the Australia-Vietnamese community. In addition, she has released six albums and hosted her own TV show on Discovery Channel Asia. Her new solo crossover album, Universal, is due out in January 2019. Van Anh’s website describes her as being also a teacher, fashionista, blogger and model. HBSO has scored a major coup in recruiting this artist for Saigon. The work she will perform here is Sergei Rachmaninov’s Rhapsody on a Theme of Paganini. This is a form of piano concerto in a single movement, composed in six weeks in 1934. It’s actually 24 variations on Paganini’s famous 24th Capriccio (caprice), said to be one of the most difficult violin pieces ever written. Rachmaninov’s melodic 18th variation is one of the most famous passages in 20th century classical music. After the interval, the HBSO orchestra will present Cesar Frank’s Symphony in D Minor of 1888. Cesar Frank was a Belgian, later French, composer who began as an organist and didn’t start to write his own compositions until middle life. Then he produced several works that have since become very famous – his Violin Sonata, his Symphonic Variations (for piano and orchestra) and his Piano Quintet in particular – plus, of course, his one and only symphony. Cesar Frank is known among musicians for his “cyclic form”. This means a form in which the different movements are linked by recurring themes and motifs, so that something you’ve heard in the first movement is repeated, probably in a different key or with other changes, in later movements. This isn’t unique to Cesar Frank, but he uses it more regularly than other composers, and relies on it as almost the basis for his compositions. Wagner had used it routinely, but in operas, not orchestral compositions. Frank taught at the Paris Conservatoire where among his pupils were the future composers Chausson and Duparc. The symphony is dedicated to Duparc. The Symphony in D Minor was found controversial at its first performance but has since gained in esteem. Much of the controversy was fuelled by anti-German feeling left over from the Franco-Prussian War (1870-71) because the symphony was believed in France to be primarily a German musical form. The work was also mocked for Frank’s use of the cor anglais (English horn) in the middle movement. This instrument has a rather strident sound and isn’t often used by composers, though Verdi used it with startling effect in his final opera Falstaff. The Symphony in D Minor has, unusually, only three movements (most symphonies have four). The concert celebrates 45 years of diplomatic relations between Vietnam and Australia. Perhaps as a sign of its importance, the concert will be conducted by the HBSO’s Managing and Artistic Director, Tran Vuong Thach. Tickets are from VND650,000 and VND500,000 down to VND80,000 (students). The event begins at 8 p.m.